The Golden State Warriors can make NBA history in their final regular-season game after equalling the record number of wins with their 72nd on Sunday. Seeking to become the first team to win 73, they won at the San Antonio Spurs, who last lost at home in March 2015. 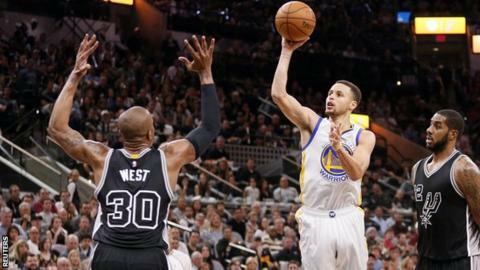 "We're competitive, we're hungry," said Steph Curry, who scored 37 in the California-based team's 92-86 victory. Victory over the Memphis Grizzlies at home on Wednesday would surpass the record set by Chicago Bulls in 1995-96.